noun. The act of accepting or supporting something willingly or enthusiastically. With the changing of the season, comes a great time for reflection. Did you know that 2016 is now over half over? Does that excite you? Invigorate you? Scare you? For me, it has been a great time to take a step back and evaluate how the year is going. I’ll be honest. A lot has changed in my life since I put my 2016 goals on paper last December. And that got me thinking about where I wanted to have my focus as we enter the warm summer months. The months where the kids are out of school. The months of new opportunities and adventures. Also the months of trying to balance work, life, and family a little differently than we do during the school year. The word that kept coming to mind? 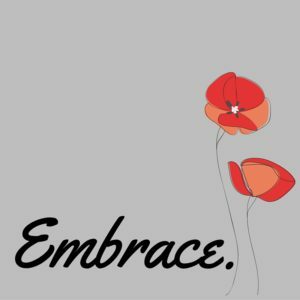 Embrace. Embracing. Accepting. Enjoying. Whatever comes my way this summer. Inviting it in. Seeing where things go. Don’t get me wrong, I’m not saying to abandon goals, hard work, and being intentional. I am just choosing to embrace the season and renew my focus to make the moments count. Let’s take the journey together this summer and embrace what life has in store.